Sparkling in the Austrian summer sunshine sits a shiny prestige saloon, which my brain automatically files as a BMW. The stance, proportions and surfacing all feel as Bavarian as bratwurst, as does the bold chrome kink in the glasshouse right above the rear axle. It’s only when I walk around to the front, to face a saucer-sized “L”, that it becomes obvious I’m looking at a Lexus. Then again, given the unsettling lines of the smaller CT 200h, perhaps a bit of careful borrowing is no bad thing. The GS is undeniably handsome and imposing, both essential qualities when trying to tempt company car buyers away from the authentically German alternatives. Inside, things are similarly Germanic and conservative. There’s none of the brave inventiveness apparent inside a Toyota Prius, for example. But it’s equally obvious that Lexus has done a confident and competent job, choosing maturely sculpted forms and peppering them with eye-catching details. I’m not a fan of analogue timepieces in cars, but even I’ll admit that the milled aluminium clock in the middle of the Lexus is an attractive and high-quality object. The interior is not a welcoming place for vegans. Smooth stitched leather covers most surfaces you might touch, swathing the seats and swaddling the dashboard. Under a deep overhanging cowl sits a very large and useful central information screen, which is a massive 12.3 inches wide if you chose the £1,000 audio-visual upgrade. The big screen is split into two independent zones so I can, for example, view consumption information in the smaller third of the screen while a navigation map fills the remainder. The joystick to control the screen is simple to use, jumping from button to button to remove the need for fine control. The on-screen graphics are a mite clunky and outdated, however. The blocky map called to mind my very first satnav, bought about a decade ago. A few other niggles also manage to spoil the otherwise consistent feeling of efficiency and elegant good taste. There’s a fabulous head-up display, for example, which projects crisp glowing digits onto the windscreen, but the button to control its options is so tucked away that it must surely have been deliberately hidden. And a gaggle of other switches governing things like the headlamp washers and blind-spot monitor seem thoughtlessly dumped onto the panel between the wheel and the door. The black GS 450h in the pictures is decked out in F-Sport trim, which is one of two versions I’ve tried, both costing £50,995. The other is the less sporty and more pillowy Premier edition, while there is also a £44,995 Luxury version – and that’s as low as the three-car range currently reaches. 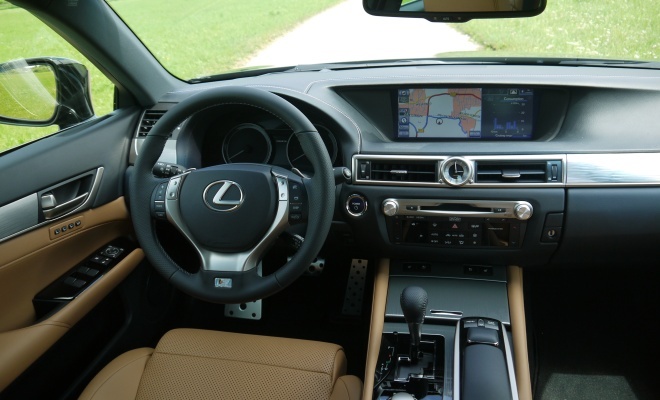 As Lexus’s people helpfully point out, Luxury comes as standard. And they even manage to say it without wincing. Luxury spec is expected to account for half of sales, with a quarter each going to the F-Sport and Premier. All models enjoy perforated leather front seats that are electrically adjustable in every imaginable direction, heated and cooled, and are much more comfortable than my bed. Which is just as well because I suspect the suspension is less cosy, particularly when saddled with the F-Sport’s 19-inch rims and 35-profile tyres. Most of the roads on the test route are as smooth as a ski slope, but the occasional asphalt mogul sends a sharp shudder through the cabin. Like other Toyota-group hybrids, the GS 450h is a two-pedal car employing automatic continuously variable gearing, accessed via a conventional leather-topped lever. A pair of paddles behind the wheel will force the gearing up or down, but they aren’t remotely necessary. Under the bonnet sits a 3.5-litre V6 engine, set up for efficiency rather than outright power and delivering peaks of 288bhp and 352Nm. There’s also a 197bhp (147kW) motor that can add a maximum of 275Nm of torque. Both deliver their power to the rear wheels, independently or in concert, offering a combined peak of 341bhp. A firmly pressed accelerator pedal – pushed past the kink in its travel designed to preserve fuel – will shrug off the car’s 1.9 tonnes and launch it to 62mph in 5.9 seconds. 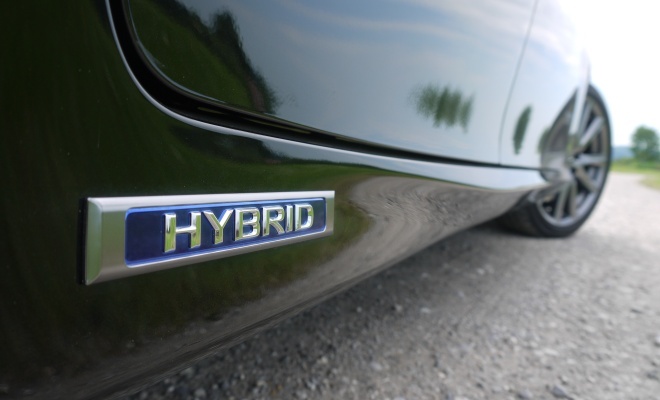 Doing so makes an uncharacteristically appealing noise for a hybrid car, the V6 producing a sustained baritone bellow. While the GS 450h will go round corners very quickly – particularly in F-Sport trim with active rear steering – it never feels truly agile. 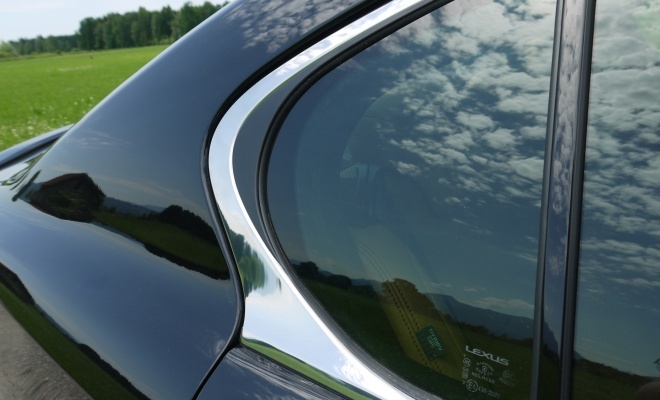 That’s not to say that the Lexus doesn’t handle – it does, helped perhaps by the 66kg of nickel-metal hydride battery over the rear axle, giving a 51:49 front-to-rear weight distribution. It just feels a little unwieldy and not much fun on twisting and undulating Alpine roads. The car does attempt to accomodate all kinds of driving. 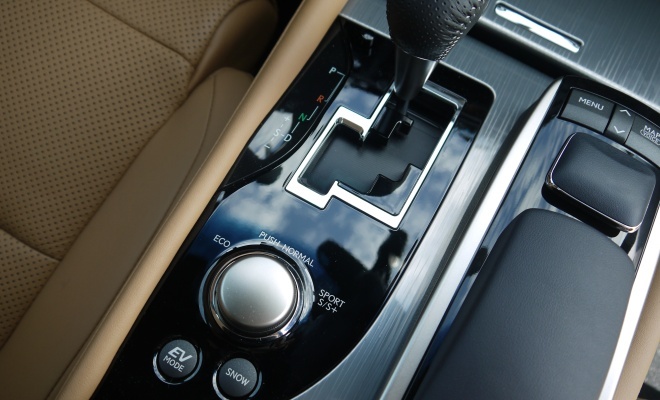 A rotary mode controller sits aft of the gearlever, switching between Normal, Eco, Sport and (in models equipped with adaptive suspension) Sport+ modes. There is also a button to access a battery-only EV mode (largely pointless) and a snow mode (which presumably isn’t). These controls are a bit awkward to reach, set quite far back on the centre tunnel, so it’s good that the car seems to retain its mode setting between sessions. Set in Eco and driven gently, the Premier version of the GS 450h gives me economy of about 6.5 litres per 100km, or about 43mpg. The car will often switch off the engine and rely on battery power alone when running around town or setting off, to keep thirst at bay. Driven normally in Normal mode, along looping mountain roads and on the unrestricted autobahn, a result of 37mpg is not too shabby for such a large and heavy car. Of course my tests are highly unscientific and your mileage will vary. Officially, the GS 450h yields 46.3mpg on 18-inch wheels, and 45.6mpg on 19-inch wheels, under the combined-cycle regime, together with CO2 emissions of 141g/km. These are impressive figures given the top-line pace of the car. 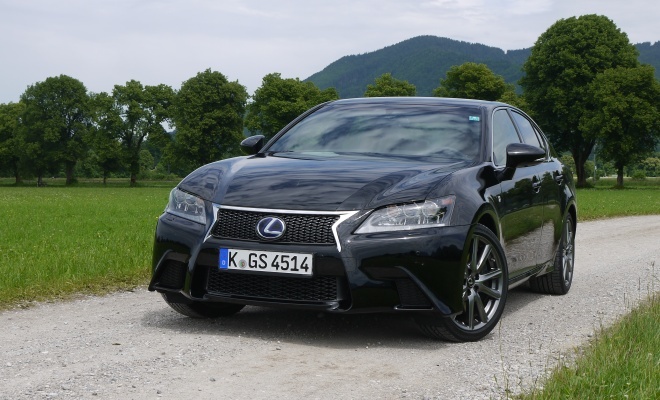 In the second half of 2013 a new hybrid will join the GS range that should produce still better economy, if not quite the same sprinting potential. 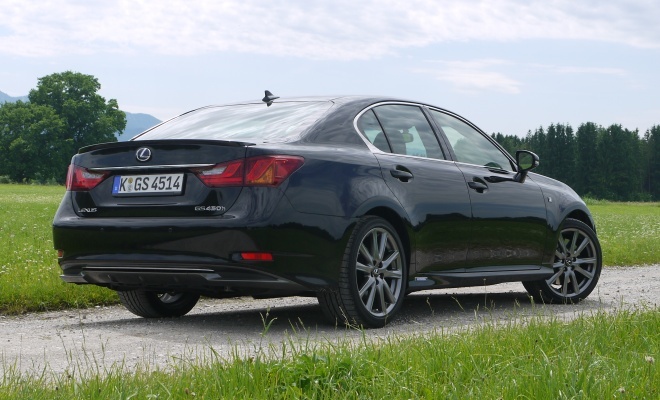 It will make do with a smaller engine, probably a 2.5-litre four-cylinder, and Lexus officials have hinted that a sub-100g/km score might be possible for that car, likely to be badged GS 300h. That might well be the car to give Lexus the success it is hoping for in this segment – the company is certainly predicting a big upswing in its sales tally at around the same time. 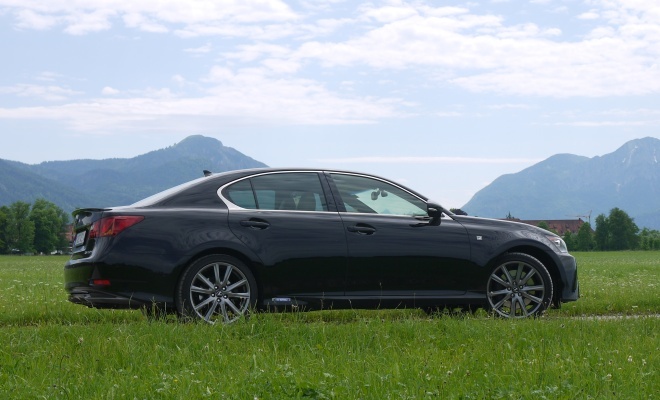 For now, though, the GS 450h remains a very good but not outstanding car. It is comfortable, powerful and handsome, and tries hard to beat the German opposition at its own game. But in the end it has a few too many weak spots to properly challenge the genuine article.